In my last post, I wrote about riding my Crossrip over mixed terrain slowly. In this post I will be writing largely about the same thing over different terrain (though this post also features delicious fried rice). If that’s too much of the same thing for you, stop reading now and ask for a refund of the money you paid me for accessing this website*. 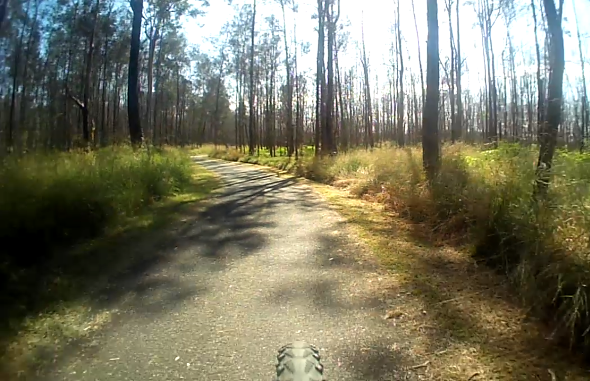 The destination of today’s little escape is the swampy bits of the Boondall Wetlands with the gravel roads running through them so I started by heading out through the bikeway next to the Carseldine golf driving range towards Deagon. 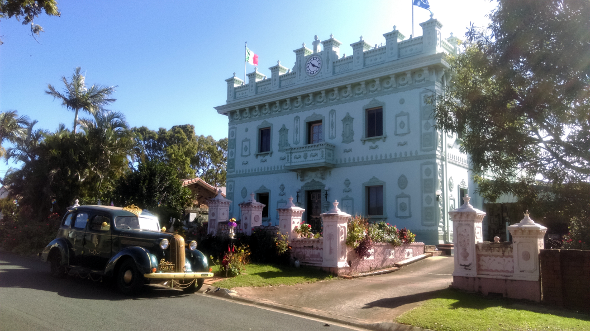 Cutting through the luxuriant new section of the Gateway Bikeway at Deagon, I headed toward Boondall where I encountered the first curio of my day. I’m a sucker for anything that breaks people’s precious social norms so this house was of particular interest to me. Art Deco? Just quirky? I don’t really know how you’d categorise it. If you have any idea, feel free to chime in below. Onward I ventured over the railway overpass at the Boondall train station which is a real pain the arse because the signs say you must dismount and walk your bike over – an instruction which I followed to the letter. 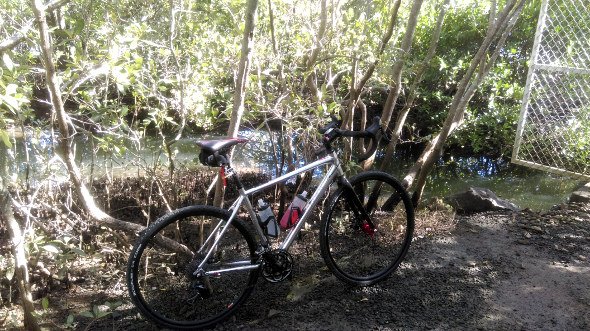 Having gotten to the other side, I proceeded a short distance down the bikeway before I arrived at the entrance to an interesting looking gravel road. Curiosity was coursing through my blood so I decided to follow the road until I arrived at this serene little clearing next to a creek where I sat and listened to the silence for a while. Retracing my steps (revolutions? ), I soon ended up back on the bikeway and upon approaching the wetlands environment centre, I observed that the Gateway North upgrade project looked like it was progressing nicely. Pity about spending all that money widening the highway but it also includes some serious new bike infrastructure so I’ll shut up about the road widening already (for now). 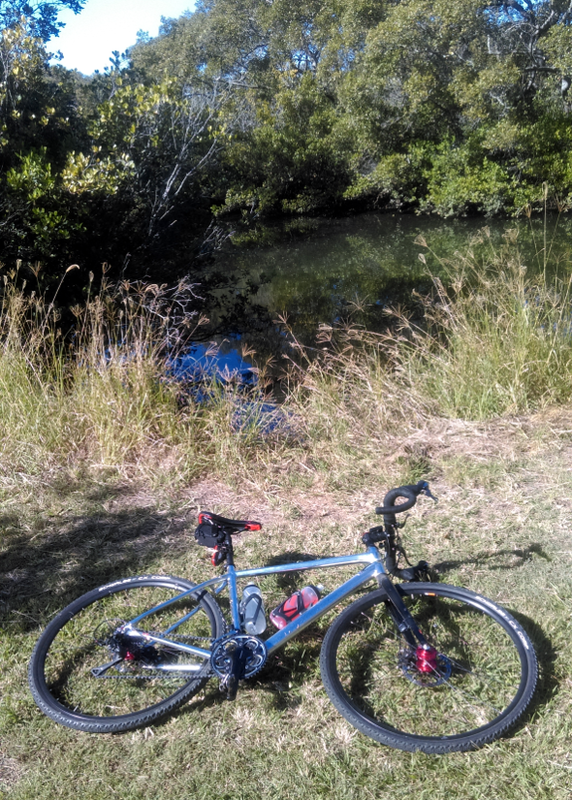 Through the chicanes and before long, I ended up at the first of the gravel roads which zigzag the wetlands. Perfect for a little casual exploring though, because I’m an idiot, I decided to turn the Fly6 off not long before that point to save power so there aren’t too many photographs of what I came to photograph in the first place. Brilliant. 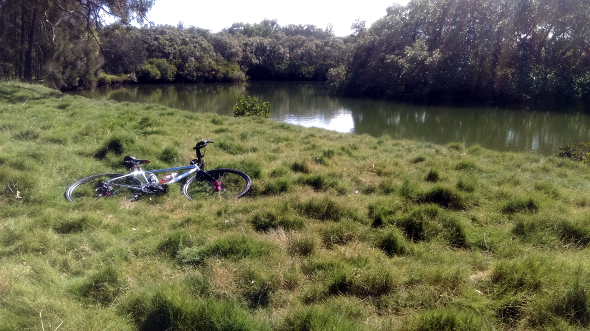 Nevertheless, I eventually got deep into the swamp where a gate I was hoping to go through to see Cabbage Tree Creek was locked but I managed to get glimpses of the creek and could hear splashing and talking as several people passed by in kayaks. Then it was time to start heading back and I did so by taking the temporary asphalt bikeway beside the Gateway Motorway while they’re building the upgrade which doesn’t really look all that temporary to me with it’s smooth, fast surface that got me back to Deagon lickety split. “So, what about the delicious fried rice?”, you probably didn’t ask. Well, by now it was past lunchtime and my escapade had left me feeling a little empty but luckily I was now near the Deagon train station which meant that I could pull in to the Dragon’s Corner Chinese Takeaway for, you guessed it, a large combination fried rice. I considered photographing my lunch but refrained because delicious as it was, 1) a takeaway container of fried rice is really not that photogenic and 2) I would no longer be able to berate people who photograph their food and post it on the Internet. 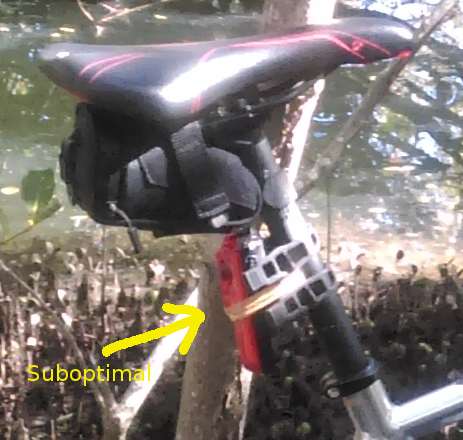 That’s all I have about the riding but before I finish up for today, I want to review and recommend a great little gizmo that I’ve been using for a few years now, the Cycliq Fly6 camera. While I find that most drivers are courteous and considerate when I’m riding on the road, you do get the odd boneheaded turnip who thinks cyclists need to get out of his/her way or die because they errantly think that their registration and fuel excise pays for the roads, that texting while driving is a natural part of human evolution, that traffic congestion is caused by bike lanes and the government not widening the roads quickly enough and that the person on the bike is indulging in recreation while they’re busily trying to get to work (to pay the fuel and maintenance for their “freedom machine” to get them to work to pay for the fuel and maintenance to get them to work….arggggghhhh!). If you’re unlucky enough to encounter one of those people, the Fly6 can help by recording any irrational, emotional or downright stupid and dangerous behavior as evidence and perhaps serve as a deterrent to some before the behavior happens in the first place. It has a recording “loop” feature which means that it records over the oldest footage you have on the camera’s SD card so that it never runs out of room and will automatically stop recording after a short period if the bike tilts past a certain angle for a certain period of time if you’ve been in a crash and thus the moments around the crash will be preserved. I bought my first Fly6 over five years ago and it has served me very well but it’s now well used and, aside from having broken the mounting bracket and resorted to rubber bands to keep it attached, it’s starting to lose a lot of battery life so I decided to upgrade to a newer model which I took possession of a few days ago. 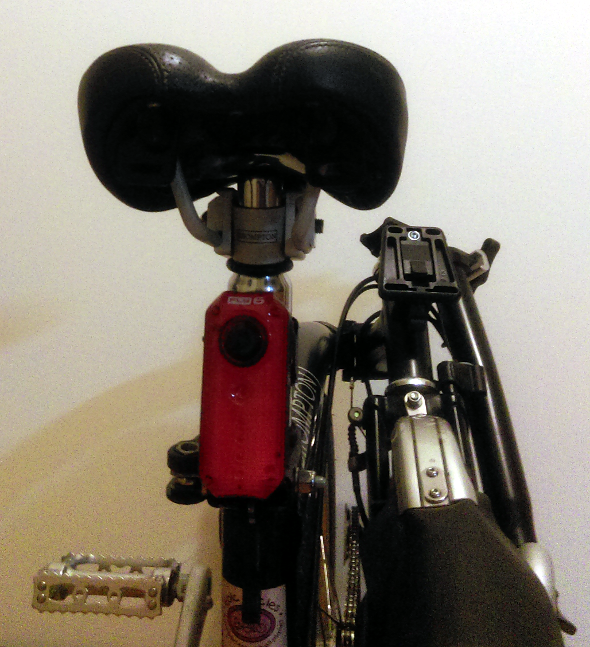 The new Fly6 mounted to the Brompton in crouching position. The newer model is smaller, lighter and has a better mounting bracket that utilises a simple velcro strap instead of a fairly fragile bracket with proprietary rubber straps on the old one. The old Fly6 was getting long in the tooth. There is an even newer model than the one I’m showing here but because I’m a tightwad I bought this one because it was on special. The battery lasts about 6 hours and charges from a laptop or power outlet. There’s a range of flashing and static settings for the light which outputs about 30 lumens and for a rear light that’s more than adequate. 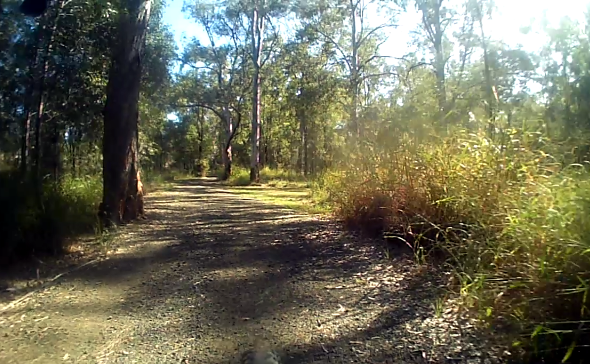 Besides being a great safety device, the Fly6‘s high quality video (yes, you can easily make out number plates) makes for great viewing of any interesting bits of your ride without needing to get a phone out. That’s it until next time. Happy travels. * Nobody is paying me to gain access to this website and there’s not a snowflake’s chance in hell I’m giving out money under any circumstances.